The Citizen’s Crime Commission recently presented two programs on policing in the United Kingdom as part of the Milstein Criminal Justice Policy Forum. London Deputy Mayor Stephen Greenhalgh, head of the Mayor’s Office for Policing and Crime, discussed crime prevention on February 12, 2015, and on March 20, George Hamilton, Chief Constable of the Police Service of Northern Ireland, and Anne Connolly, Chair of the Northern Ireland Policing Board, discussed the roles of accountability and human rights in building community confidence in the police service. Howard Milstein introduced both programs. Deputy Mayor Greenhalgh has headed the Mayor’s Office for Policing and Crime since June 2012. His job is to ensure that all of London’s public services coordinate to prevent crime, deliver swift justice, and reduce recidivism, Mr. Milstein said in his introduction. Looking to the future, Hamilton said that despite 13 years of progress, challenges remain. “For example, financial challenges: we’re facing very significant budget cuts for our organization. But change does not need to be an impediment to building trust in policing. Because the three pillars that I spoke about will all be the hallmarks of how we respond to the austerity and the budgetary pressures that we are now in. The PSNI also faces security challenges, as do so many other police departments. “While peace is one thing nearly everyone in our community wants, there remain a small number of individuals and groups for whom violence is their only answer,” Hamilton said. “Far from being an excuse to step back, I and my officers believe that doing our jobs in such challenging circumstances makes policing with the community all the more important. Northern Ireland Policing Board Chair Anne Connolly then spoke about the duties of the Board, which is responsible for oversight of the PSNI. Relations with the police can be contentious, but “Whatever the difficulties, it is very, very important for the Board and the Chief Constable to have a shared vision around the style of policing service to be delivered to the people of Northern Ireland, and priorities to meet within that delivery of service.” It has policing with and in the community at its heart. They share the definition of policing with the community, Connolly said. She explained that the board is made up of 10 political representatives and nine independent members, representative of the community. All political parties participate in the board. Visitors to Northern Ireland who walked the beat with local police recently noticed that human rights was part and parcel of the officers’ daily duties. “It has really become part of the culture, and that was our cue that we were getting it right,” Connolly said. “We can never be complacent. There is no way we will say ‘we got it right.’ We are always looking to be better,” Connolly said, adding, “Policing has paid a pivotal role in the peace process in Northern Ireland. It was referred to at a breakfast yesterday as ‘the jewel in the crown.’ But it still has a key part to play in moving forward. Deputy Mayor Stephen Greenhalgh and Howard Milstein at the Citizen’s Crime Commission ‘s Milstein Criminal Justice Policy Forum. Ashley Cannon, Director of Public Policy, Citizen’s Crime Commission; Anne Connolly, Chair of the Northern Ireland Policing Board; Howard Milstein; Chief Constable George Hamilton, Police Service of Northern Ireland (left to right). 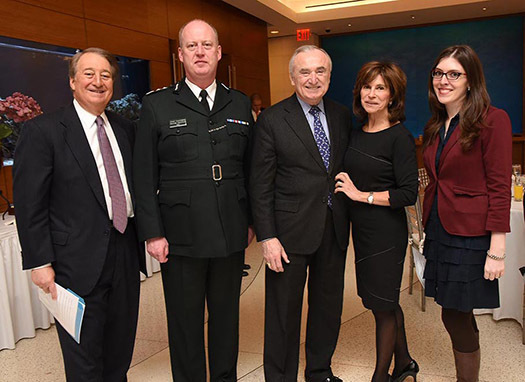 Howard Milstein; Chief Constable George Hamilton; NYPD Commissioner William Bratton; Rikki Klieman; and Ashley Cannon, Director of Public Policy, Citizen’s Crime Commission (left to right). 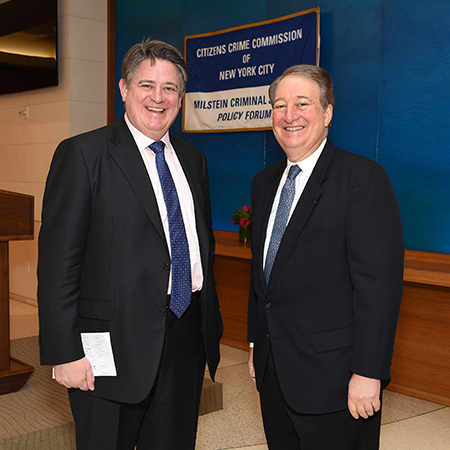 Howard Milstein introduces London Deputy Mayor Stephen Greenhalgh at the Milstein Criminal Justice Policy Forum on February 12, 2015. 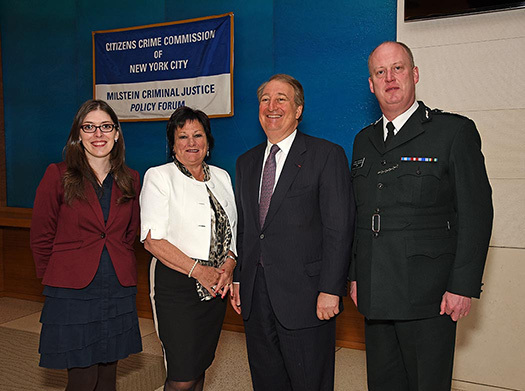 Howard Milstein introduces Chief Constable George Hamilton of the Police Service of Northern Ireland and Anne Connolly, Chair of the Northern Ireland Policing Board, at the Milstein Criminal Justice Policy Forum on March 20, 2015.